When I decide to give the under sung taco form of desebrada its proper due and dedicate a seven part series to it, I have no way of knowing how hopelessly rare it is. I search high and low and make many dry runs across our city before finally sampling enough places to have an accurate take on the current state of this delicious form..
As the series winds down I realize it’s time to revisit the taqueria where my desebrada virginity was snatched from me; Taqueria El Chanclas in Pilot Knob Texas. Eleven years is a lifetime in the world of taco carts. 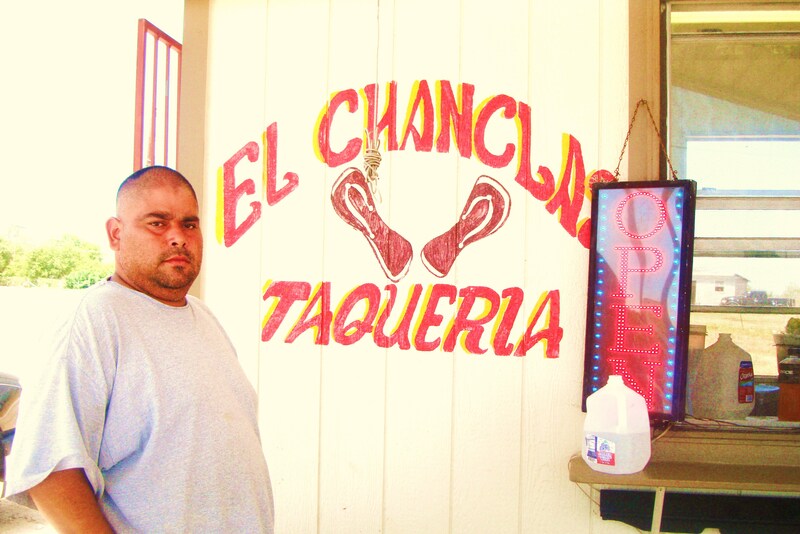 Austin native, Cain Ramirez has seen both the genesis of the lonchero as well as the rise of the chef driven food cart of modern Austin since he opened his doors back in the year 2000. He remains unswayed. He knows he’s near the top of the game and watching hundreds of competitors come along is not changing a damn thing. After all, the taco cart scene in Pilot Knob is quite a bit different than in the heart of Austin. Taqueria El Chanclas sits quietly in a gravel parking lot on the side of busy Hwy 183, ten minutes south of Austin proper. It’s a tidy little affair with a big metal awning providing much needed shade from the brutal Texas sun. The tables are filled with beefy Mexican cats all tucking into big bowls of menudo and plates of crafted tacos on scratch corn tortillas. I order my food as owner Ramirez walks up. He remembers me from previous visits so we sit a spell while I wait on my food. Business is good in uninincorporated Travis County. Ramirez’ cart sits at an extremely busy intersection and a constant flow of patrons are coming in for big sacks of tacos and bowls of menudo. My desebrada taco arrives and it’s delicious. The corn tortilla is hot off the comal of taquera Eliza and she exhibits a highly skilled hand. It’s fluffy with manteca and shaped like a cloud. It’s been awhile since I’ve had a tortilla this good. The best desebrada is carefully cooked so it falls into shreds that literally melt when you begin devouring your taco. El Chanclas version is a paragon of the form. It’s good to know that little has changed in the five or so years I’ve been eating here. The creamy, emulsified, bright green salsa is good and fiery. This is a common style in Central Texas made popular by being the salsa du jour of the grilled chicken carts that abound in Austin. You could eat this desebrada with no sauce if you choose. It’s that good. I make my way to leave and Cain Ramirez and I exchange pleasantries. He’s excited by the construction of the nearby Formula One track that’s opening next year. I have a feeling that he won’t be the only game in Pilot Knob for long as Austin food carts with dollar signs in their eyes will be along to welcome the race fans with overpriced tacos on factory tortillas. But there’s no point telling him that. He’s been successful for over a decade doing his business the right way so he’ll prosper no matter who shows up for a piece of the pie. This entry was posted in The State of Desebrada in Austin Texas and tagged Austin, corn tortilla, east austin, food trailer, salsa, scratch tortilla, south austin, Taco cart, tacos, taquera, taqueria, texas. Bookmark the permalink. Don’t all the La Michoacanas have deshebrada? I’ve had a craving for deshebrada lately and came back here to read the series, envious that it was common enough in Austin to merit this much reporting, but I see it’s as rare there as here. I’ve located only two places that have it regularly, 3 others than do it maybe once a week. Taco trucks that have it listed on the menu don’t have it. Carnicerias fall into the occasional category. The search goes on but I think I’ll try my own. BTW, if the La Michoacanas (carnicerias) there are related to the ones here (state-wide), some have it, some don’t, occasionally, in my experience. Can be pretty good, though. I do believe that Santiago, the owner of La Michoacana does own all the stores statewide and it’s a devil finding the stuff. I had a great desebrada taco yesterday at La Flor on South First st. John T. Edge gave them a mention in New York Times a while back.